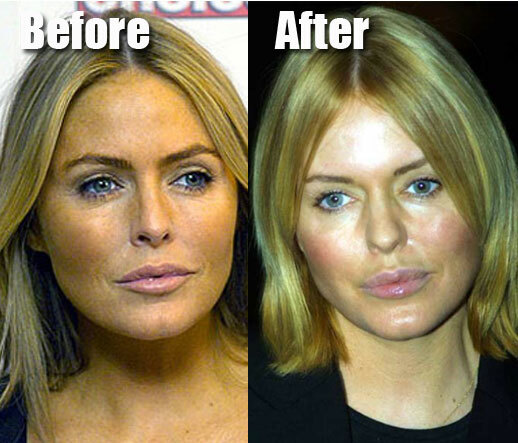 Patsy Kensit before and after plastic surgery, lips and botox? Patsy Kensit isn't very well known globally, but over in the UK shes totally the cats pajamas, known mainly for her work on television among other things such as her relationships with wealthy men. It starting to look like maybe the spotlight on Patsy Kensit has shined a little too bright, which might be the reason she decided to give plastic surgery a shot. The before and after pictures reveal a major increase in the overall size of Patsy Kensit's lips, making them overly trout pout-licious. Plus in her more recent pictures she appears to have tighter skin than we've seen in the past, which is perhaps the result of botox injections. Frankly speaking i loved your look before the treatment only. But getting botox injections not only treats facial wrinkles, also it is proved as an effective treatment for headaches also. trinny woodall's botched fish lips are on a par with leslie ash's.